It's cold outside in much of the country. How can you reduce heating costs and keep your facility warm? No surprise: workers who are constantly exposed to cold air aren’t as productive or accurate as those who are comfortable. But we are talking about a warehouse environment, and this kind of discomfort can be offset by the fast-paced, physical nature of the job, at least to a point. OSHA has never issued regulations for cold temperatures but does have specific guidelines. Further, studies have shown that workers may be greatly impacted by uncomfortable temperatures. They get less done and make more mistakes when they are cold. 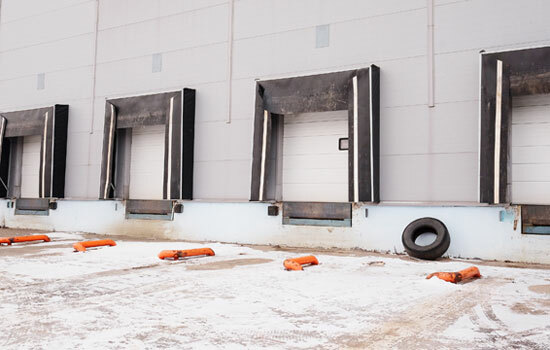 These issues are especially acute near large, frequently open dock doors. Per OSHA: Employers should train workers on how to prevent and recognize cold stress illnesses and injuries and how to apply first aid treatment. Workers should be trained on the appropriate engineering controls, personal protective equipment and work practices to reduce the risk of cold stress. This might pertain more to workers who are constantly outdoors, but if your facility is cold enough, or if you have extended periods of open dock doors, or if forklift drivers are in and out all day working to load/unload trucks in the yard, you should be certain they are wearing proper gear, and that they understand symptoms of cold stress injuries. Make sure they have adequate gear for the situation and that they understand to monitor each other’s condition. People should be aware of cold stress injuries, particularly frostbite and trench foot. Brief your workers on the range of symptoms for each and be sure they self-monitor. First aid training specific to cold weather injuries should also be part of the plan. People working in cold environments are surprisingly susceptible to dehydration. OSHA advises that employers provide plenty of “warm, sweetened beverages” for cold weather workers to encourage hydration. Warm break rooms should be available for workers who are constantly in the cold. Efficient picking paths and product slotting are good ways to reduce cold based issues, as workers will spend less time wandering around a cold facility in search of an SKU. Warehouses are by nature large, open structures. Whatever enters that dock door will generally impact the climate insides. If the doors are frequently open (and they are at many facilities), what can you do to help preserve the warmer air inside? One of the best ways to deal with cold air is to limit it at the dock door. 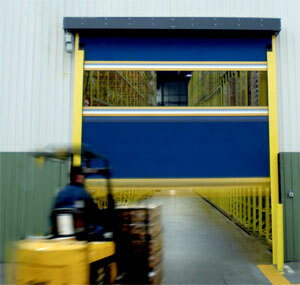 Strip doors, which can be built to virtually any overhead door, are ideal for this. They help control the passage of heated or cooled air from climate controlled environments. Once installed on a dock door, forklifts and people can simply walk through the portal. Once they clear it, the clear strips fall back into place to provide a barrier that minimizes the amount of escaping warm (or invading cold) air. If you need to segment part of your building from cold air seeping from the dock area, one of the more economical ways is to use a temporary insulated curtain wall. This is a good option if you don’t want to—or can’t—erect a permanent wall. A curtain wall also allows you to remove it seasonally if needed, so there is more flexibility this way than with permanent walls. Insulated curtain walls are available in configurations that should allow you to segment off any particular area of your facility that you want. We’ve seen them put to good use in a range of operations, including 3PLs (where you could see storage requirements vary for particular types of clients) to manufacturing, pharmaceutical, general storage, and others. 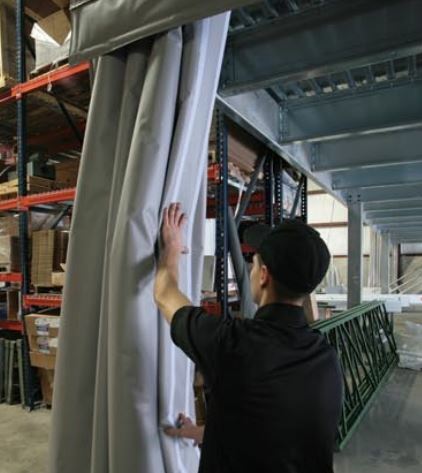 For beverage distribution, where the SKU profile and facility layout may change frequently, climate curtains are a particularly valuable asset, since they can protect liquids from temperature exposure. 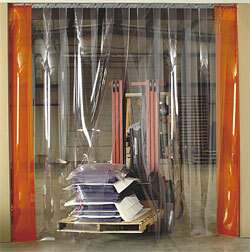 Thermal curtains are not as tall as full-fledged wall systems but are great for many warehouse applications. They range to 12′ in standard heights, which makes them ideal for curtaining off a mezzanine, warehouse work corner or other areas. They are collapsible on ceiling mounted tracks quick movement to one side when not in use. Curtain walls can be integrated into doors, rack rows, etc. A variety of high-speed doors are available that reduce the amount of time your building has exposure to outdoor elements. High-speed doors are also good for interior applications between heated/cooled areas and uncontrolled areas. They can be fully powered so that they close once a forklift has passed the portal, close while it’s outside doing its work, re-open when it returns, and close again once it’s inside. All of this can take place at speeds up to 48″ per second, meaning that the door is open only as long as needed. Also, since dock doors themselves aren’t typically insulated very well, the cold tends to radiate from them. You can opt to purchase insulated door panels to help with that issue. HVLS fans are good for distributing climate around a building. Mostly thought of as ways to cool a building, they are also useful for helping to distribute climate evenly from one sector to another. They reduce heating costs by circulating heated air back toward employees, rather than letting it linger near the ceiling of a tall warehouse. This should also reduce energy consumption, climate control and HVAC costs. Thermal equalizing fans are helpful because destratify temperatures from ceiling to floor. 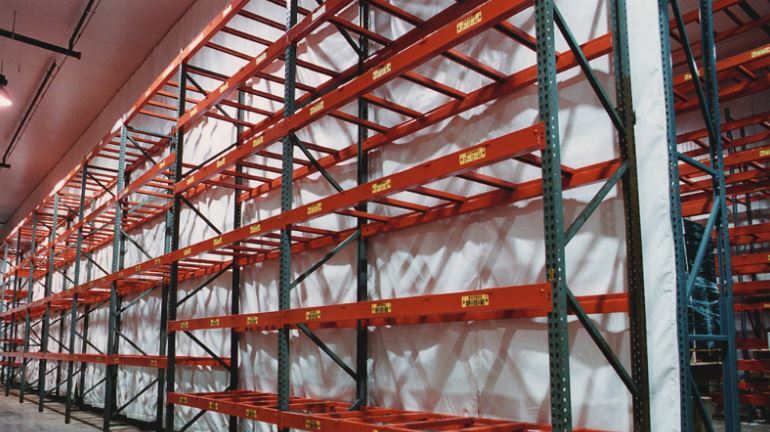 In a tall warehouse temperatures range greatly between the floor and a ceiling that can be 25 feet or more high. These fans can be deployed in any room with ceilings as low as 8 feet or as tall as 1o0 feet. When the air is static, warmer air remains at the ceiling level. This difference can be .75 degrees per foot. That’s a big difference (and a lot of wasted, warmer air) in a tall warehouse facility. If your ceiling is really high, it adds up quickly. These fans create vertical air flow from the ceiling to the floor and destratify that temperature. Colder floor air is forced up while warmer air is simultaneously pushed down. Aside from reducing temperature gradients, this dynamic helps reduce energy consumption and stress on HVAC systems. Forklift drivers who have to exit the warehouse for a cold, drizzly day are at more risk when show, ice or rain are allowed to fall on them. Economical forklift cab covers can protect them from the elements as they make outdoor runs. Usually these are inexpensive and easy to install. Importantly, they may also protect that driver from an item that falls off a rack. There are also zippered “tents” that can be installed around the roll bar that help reduce wind and moisture considerations.